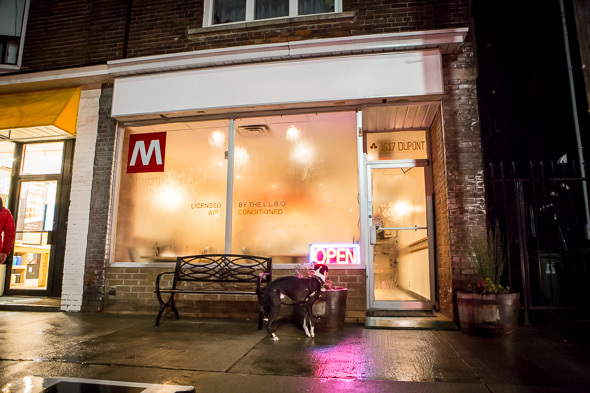 Mattachioni is a low-key Italian bakery, bodega and pizzeria in the Junction Triangle that was previously Leiria Bakery (as a reminder of its former identity, the Portuguese city's crest remains on the ceiling by request of the former owner). 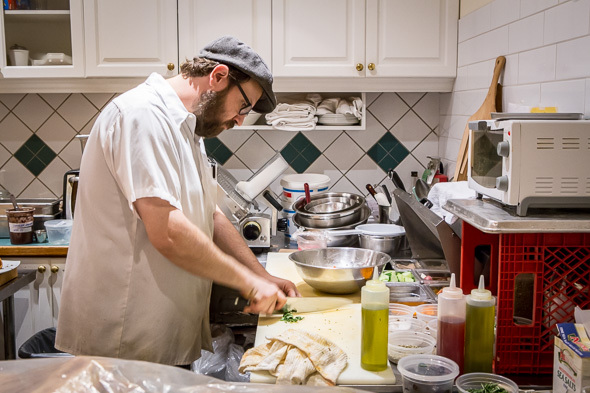 David Mattachioni - pizzaiolo and 14-year Terroni veteran - has dreamed of having a pizzeria of his very own for a long time. After leaving Terroni in 2013, Mattachioni made wood-fired pies for Norman Hardie Winery in the summers, Drake One Fifty in the winter and also for the short-lived Citta at CityPlace before finally turning his dream into a reality here. 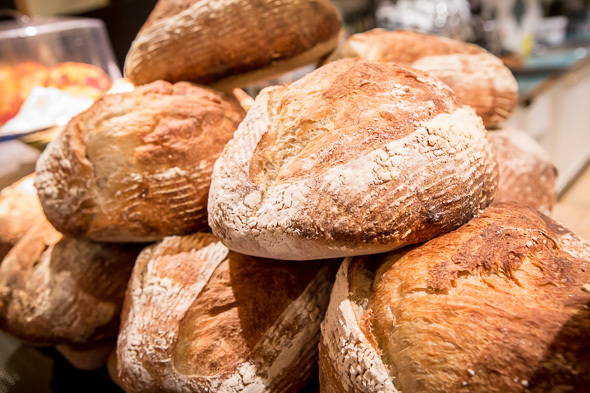 When he and his team first opened, they were only making fresh bread and panini, but now that the wood-fired oven is up and running in the back room, a small selection of made-to-order pizze has been added to the menu. Mattachioni is slowly introducing new aspects to the operation, with future plans to cure his own salumi and even offer gluten-free sourdough. Just about everything you can order to eat here is made and prepared in-house (with the cannoli shells and the gelati being some of the few exceptions), and most of the produce - and of course the bread - used to make the food is for sale here should you want to pick up some milk, meat, cheese, eggs, fresh herbs or other groceries. There's seating for 23 diners in the small front space (take-out panini for lunch appears to be popular too), outfitted with a few tables and some church pews inherited from the back patio of the now-shuttered Ursa . The entire place has a very unpretentious feel to it, and pics of Mattachioni's friends who helped him open this spot can be found on the wall towards the back. If dining in, there are a few Italian wines ($6-$7/$40-$50) plus a couple from Norman Hardie ($7-$8/$50-$60), along with bottles of Anchor Steam ($6 each) and a short list of cocktails ($10 each) to imbibe. 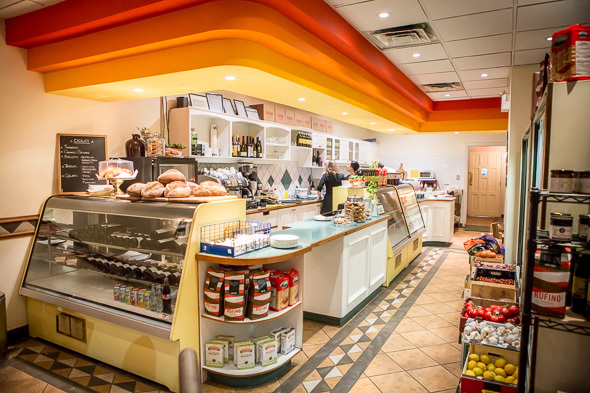 Eats-wise, the menu is split into salads, sandwiches and pizzas. 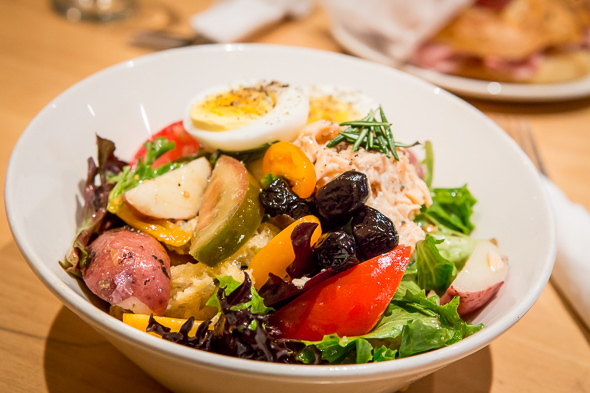 We try a Saturday's Salad ($12), which contains mixed greens, potatoes, grape tomatoes, oil-poached salmon, hard-boiled egg, unpitted olives, crunchy crouton-like pieces made from dehydrated sourdough, and a bit of fresh rosemary. 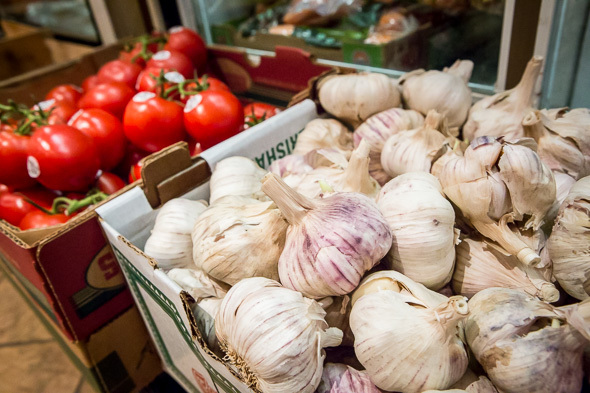 It has a great variety of ingredients and would make for a nice lunch. 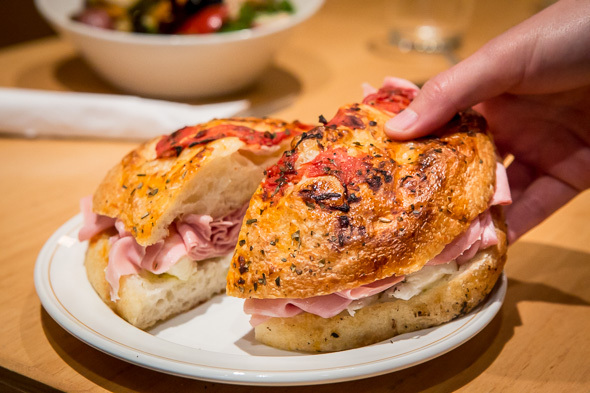 A mortadella panino ($8.50) is a simple combo of the the well-loved Italian lunch meat, thinly sliced, and fresh, salty and creamy mozzarella stuffed between puffy, house-made tomato focaccia. As for the thin-crust pizze, they're all made with naturally leavened sourdough that contain only three ingredients: fermented flour, water and salt. They all come in one size (definitely enough for one person, or two not-too-hungry people) and are served uncut. We get the Carlo & Giulia ($17), a pizza bianca topped with fresh mozzarella, taleggio, salty black olives with pits, hot cacciatore salami and fresh basil. The crust has a decent amount of char around it, and the two cheeses taste so good that I don't miss having sauce at all. This local neighbourhood joint blends in well with its up-and-coming surrounds, adding another option to the burgeoning food scene on this stretch of Dupont. 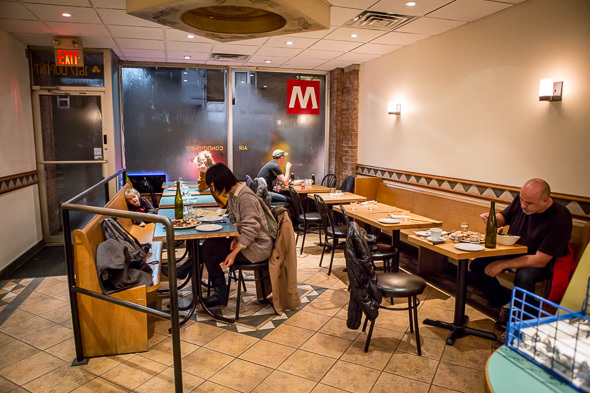 During our weeknight visit, a steady stream of solo diners and parents with young kids come in to eat, likely lured by Mattachioni's pizza-making prowess. Just look for the red and white "M" on the window out front.